Windows Prefetch files, introduced in Windows XP, are designed to speed up the application startup process. Prefetch files contain the name of the executable, a Unicode list of DLLs used by that executable, a count of how many times the executable has been run, and a timestamp indicating the last time the program was run. Although Prefetch is present in Windows 2003, by default it is only enabled for boot prefetching. The feature is also found in Windows Vista, where it has been augmented with SuperFetch, ReadyBoot, and ReadyBoost. SuperFetch; analyzes per-machine usage patterns over time and optimizes the data that is kept in memory. ReadyBoot; decreases boot time (the time from turning power on to reaching the log-on screen) by preloading the files and startup programs needed per-machine into a cache. ReadyBoost; supports the use of flash storage devices like Universal Serial Bus (USB) flash drives and Secure Digital (SD) flash cards to boost PC performance. ReadyDrive; supports hybrid hard disk drives. Prefetch can be disabled, which initially was done on systems with SSD drives. See "Registry Keys" below for more information. A Prefetch file contains the name of the application, a dash, and then an eight character hash of the location from which that application was run, and a .pf extension. The filenames should be all uppercase except for the extension. E.g. a filename for md5deep would look like: MD5DEEP.EXE-4F89AB0C.pf. If an application is run from two different locations on the drive (i.e. the user runs C:\md5deep.exe and then C:\Apps\Hashing\md5deep.exe), there will be two different prefetch files in the Prefetch folder. According to MSDN up to 128 Prefetch files can be stored in the Prefetch directory . The Prefetch file contains various metadata. The executable's name, up to 29 characters. The run count, or number of times the application has been run. Volume related information, like volume path and volume serial number. The size of the Prefetch file (sometimes referred to as end of file (EOF)). The files and directories that were used doing the application's start-up. The time when the application was last ran (executed). Version 26 of the Prefetch format maintains 7 previous last run times. The volume creation time (part of the volume information) of the volume the Prefetch file was created on. The file system creation time of the Prefetch file indicates the first time the application was executed. Both the file system modification time of the Prefetch file and the embedded last run time indicate the last time the application was executed. The EnablePrefetcher Registry value can be used to disable prefetch. 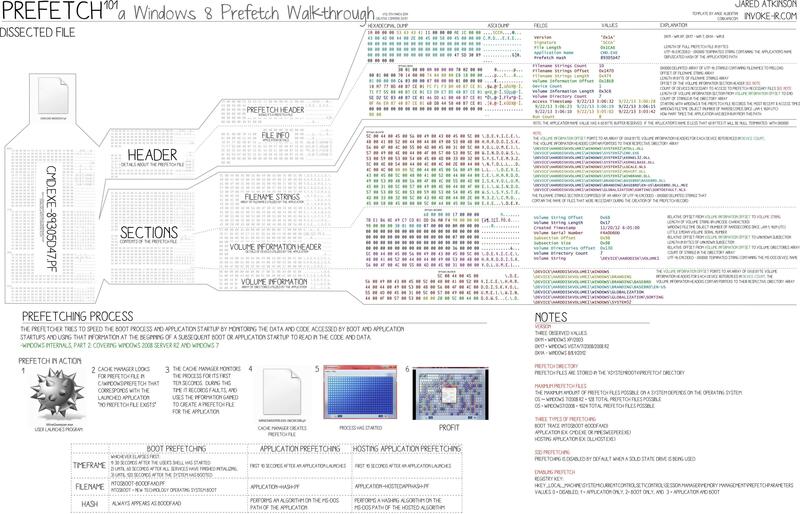 Prefetch, Prefetch parser written in C# with support for XP through Windows 10. PECmd, Prefetch command line tool using Prefetch parser above. This page was last modified on 26 April 2018, at 04:29. This page has been accessed 316,734 times.